We recently spotted a rather unusual vehicle in construction in the Warrington-based Unique Van Bodies (UVB) factory. 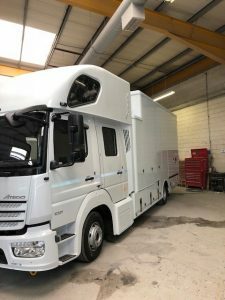 The vehicle will shortly join a firm who placed the special order for this truck and had the clear need to accommodate a few more crew members than usual. Rob Hampson, the General Manager of UVB, said ‘to our knowledge no-one in Europe builds these but us’. We also asked him why there are no examples of rear engine moving trucks. Our thought was that there would surely be a huge space advantage in locating an engine at the rear and simply using side loading doors which these days seems to be the preference anyway. The additional weight might be accommodated by using a three axle chassis. Rob said I suppose it depends on the manufacturers, it was tried sometime back but the torque is greatly reduced through the prop shaft plus the turning circle is also greater on a coach body. Another down side is that it made steering the vehicle very light and once loaded would be worse, so to compensate additional weight was put onto the front chassis which then impacted the total payload and defeated the object of the exercise.